Speaking after Saturday’s 4-2 home defeat by Glenavon, Ferguson admitted that he is being frustrated in his efforts to sign a new defender. 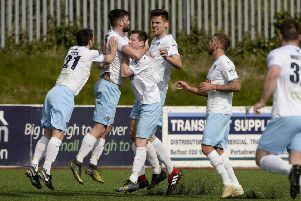 Ballymena United duo Brian McCaul and Stuart Addis look towards the referee's assistant as Glenavon's Ciaran Martyn wheels away after scoring the opening goal in Saturday's game at the Showgrounds. The United boss also looks ahead to his side’s fifth round Irish Cup tie with Amateur League Crumlin Star this Saturday.